What is Ash Wednesday? Why are we having a church service on that evening? Isn’t that something that only Catholics do? Pastor David, do you really expect us to put dirty ashes on our foreheads? Those are all good questions, so don’t be afraid to ask them. I’d like to try to answer them now for you so that you have a better idea of what this experience will be like. To my knowledge, Mt. 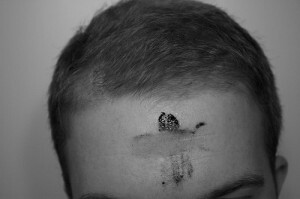 Haley has not had an Ash Wednesday service in a very long time, if ever, and certainly not in the past few years. Ashes are a biblical sign of mourning and repentance (Job 42:3-6). Also, ashes remind us that we are dust and to dust we will return (Genesis 3:19). That biblical truth is found in the midst of the story which explains why people die: death is a direct result of our sinfulness. So in the period of time that precedes Easter, Christians remember how our sinfulness separates us from God. Only then does it make sense to celebrate Jesus’s resurrection on Easter Sunday: he has conquered sin and death, and those who are in Christ experience victory over both. I challenge you, then, to begin the season of Lent by coming to worship God at 7pm on Ash Wednesday, February 13. This type of service is practiced by many different Christian groups, including but not limited to Roman Catholics. We at Mt. Haley will not put ashes on our foreheads, but we will reflect on our need for repentance and forgiveness. My prayer is that this service will help us enter a reflective state of mind throughout Lent, so that we might remember the beauty of Maundy Thursday, comprehend the magnitude of Good Friday, and celebrate wholeheartedly the victory of Easter Sunday.